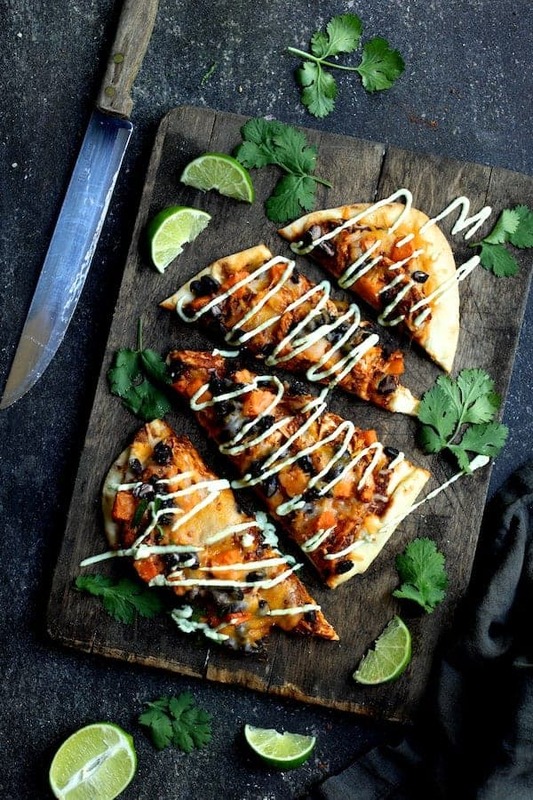 Chipotle Chicken, Sweet Potato and Black Bean Flatbread Pizzas with Avocado Sour Cream are spicy, healthy-ish and delicious! 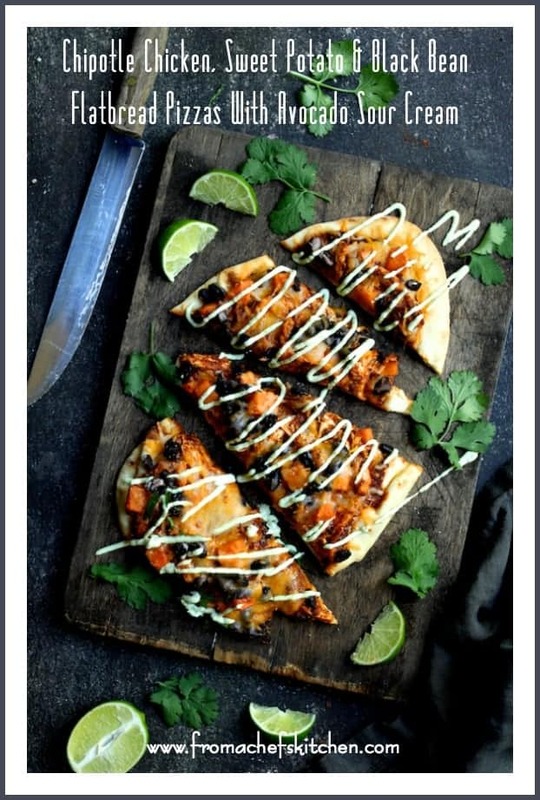 It’s how to get your Mexican food fix and pizza fix in one! Happy Saturday and Happy Cinco de Mayo! Okay, I’m probably a little late on getting this Mexican-inspired recipe posted for Cinco de Mayo. However, we love us some Mexican food any day of the year! All you have to do is go through my Recipe Index and you’ll find tons of Mexican recipe inspiration. My sister-in-law is Mexican which gives me even more reason to love Mexico and its culture. My brother lucked out BIG TIME when he met her! In addition to planting some flowers and my herb bed, I had a super-busy workweek. 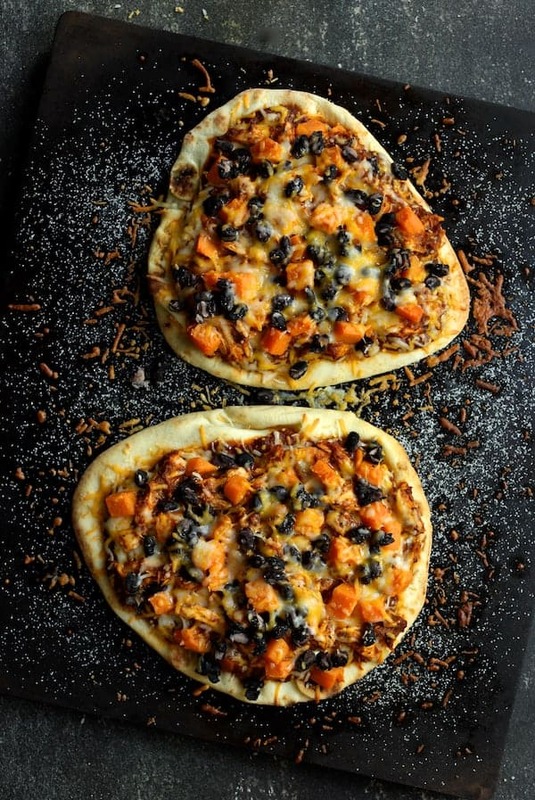 These Chipotle Chicken, Sweet Potato and Black Bean Flatbread Pizzas made the perfect meal! Start with store-bought naan flatbread; it’s something we always have on hand for a quick pizza. I actually love to make my own pizza dough, but sometimes the chef needs a little help! I made a quick red chile sauce with onion, Poblano peppers, canned tomato sauce and chipotle chiles in adobo then pureed it with an immersion blender. If you don’t own and immersion blender, it is the best thing ever! 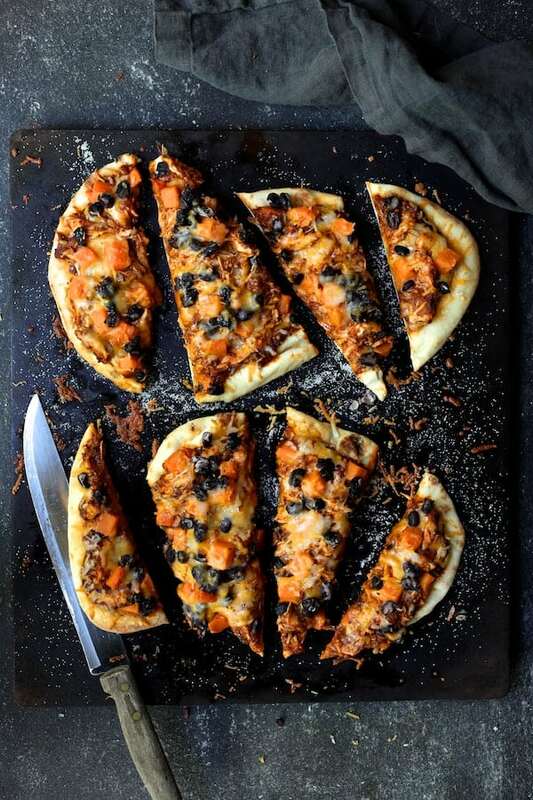 This Chipotle Chicken, Sweet Potato and Black Bean Flatbread Pizza is a great way to use leftover chicken. However, rotisserie chicken works well, too! If you don’t have cooked sweet potatoes on hand, peel and cube a large sweet potato and cook it in salted water while the sauce simmers. Then, simply sauce the flatbread, top with cheese, toss the chicken with some of the sauce and add the sweet potatoes and black beans. And of course, more cheese! One more indispensable thing in the kitchen is a pizza stone! Ours is well-loved, can you tell? You’ll notice, too, that I made my second kinda-real video! 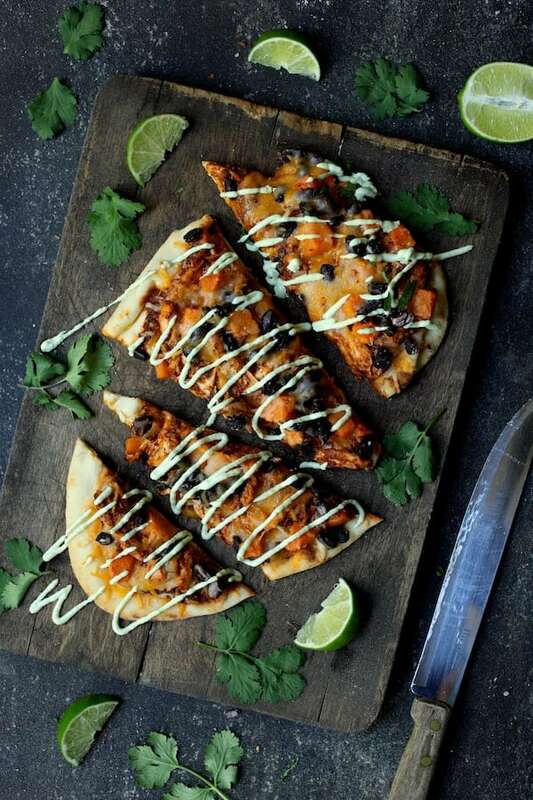 Hope you enjoy the video and the Chicken Chipotle, Sweet Potato and Black Bean Flatbread Pizzas with Avocado Sour Cream! Be sure to try my Naan Potato Pizza with Radish Top Pesto and Smoked Mozzarella for a truly gourmet flatbread pizza! SAUCE: Heat oil in a large saucepan over medium-high heat. Add the onion and Poblano pepper, reduce heat to medium and cook 8 to 10 minutes or until very soft. Add the garlic and cook 30 seconds or until fragrant. Add the tomato sauce, chipotle chiles, chili powder, cumin, coriander and oregano. Bring to a boil, reduce heat and simmer until thickened, 8 to 10 minutes. Puree with an immersion blender until smooth or carefully transfer to a food processor or blender and process until smooth. Place a pizza stone in the oven and preheat oven to 375 degrees. PIZZAS: Sprinkle a small amount of cornmeal on a pizza stone. Top each flatbread with equal amounts of the sauce then toss the chicken with remaining sauce. Sprinkle even amounts of the cheese on the sauce, reserving some for on top. Follow with chicken, sweet potato and black beans. Top with remaining cheese. Bake for 20 to 25 minutes or until heated through and edges of flatbread are beginning to brown. Garnish with cilantro and serve with Avocado Sour Cream. AVOCADO SOUR CREAM: Combine sour cream, avocado and lime juice in a food processor or blender. Process until smooth. Cook time does not include time for cooking chicken or sweet potatoes.